Catch a special celestial showcase in tonight's skies as we are treated to the full snow moon, a partial penumbral lunar eclipse, and a comet. February's full moon is nicknamed the 'Snow Moon' and here in Philadelphia we just so happen to have a fresh blanket to set the scene. The lunar eclipse will begin at 5:34 p.m. local time and end at 9:53 p.m. This will be a partial eclipse, where the moon only slightly enters Earth's outer shadow (or penumbra), and you will only notice the moon dim and turn a darker gray. The height of the eclipse will be at 7:44 pm. You can watch live video of the entire event starting at 5:30pm from the Slooh observatories. Later, the comet Comet 45P/Honda-Mrkos-Pajdušáková will be making it's closest approach to Earth at 7.7 million miles. This comet of ice, which glows green, was discovered in 1948 and comes by every 5 years. You won't be able to see it with the naked eye, you must use binoculars or a telescope. The best time to look would be closer to dawn. It is passing by the constellation Hercules. Although Comet 45P will be at it's closest Saturday morning, it will still be around the next few weeks. 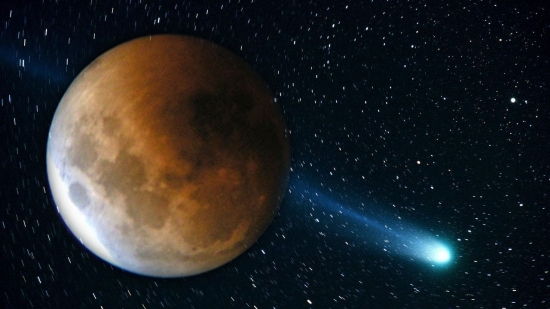 You can watch live video of the comet starting at 10:30pm from the Slooh observatories.